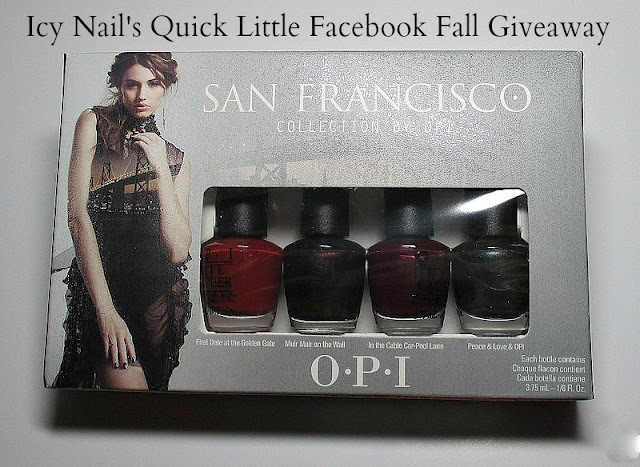 I bought a set of OPI San Francisco minis so that I could have a little giveaway over on my Facebook Page. It is running through 9/22. You just have to click the link, above, or the picture in my sidebar gadget pushing my giveaway or my Facebook social media button to travel to my page. The giveaway is pinned to the top of my page. The post is a bungled up looking piece of business but the rules are simple, entry is fast and easy so, if you are on Facebook, come on over, Like and enter to win some OPI Fall prettiness for your nails. Admit it. You want them. So, what are you waiting for? Click here and go to my Facebook page and enter.